Limited time only! 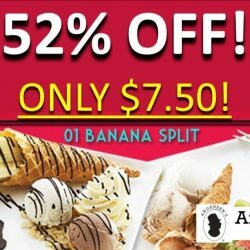 Qoo10: Andersen’s Ice Cream Banana Split & Single Fondue at 52% OFF! Grab this limited time offer at Qoo10! 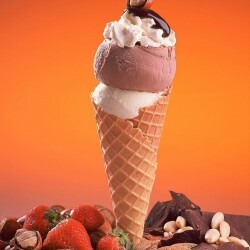 Enjoy a banana split or single fondue with 2 scoops of ice cream at Andersen's Ice Cream for only $7.50! That's 52% off! And if you have Qoo10 qpoints, you may pay even less! Grab the e-voucher now! 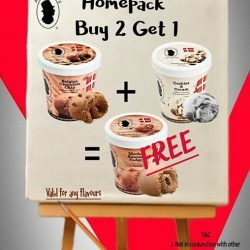 Launching new GSS Promotion : Homepack Buy 2 Get 1 FREE (worth $13.95)! Valid at all outlets till 31 July 2016, except Tampines 1. 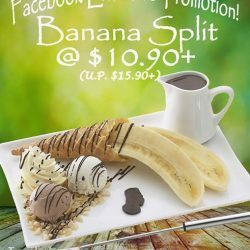 Like our Facebook page and flash to the staffs upon ordering to get a Banana Split for only $10.90 (U.P. $15.90). NOW till 15th July 2016! Satisfy your sugar cravings now at Andersen’s where you get to upgrade your single scoop ice cream to a Regular Double for only $1 extra! Served in freshly baked waffle cone with free topping, it tastes as yum as it sounds! Valid till 27 July 2015, hurry! What’s up with the super hot and humid weather everyday? 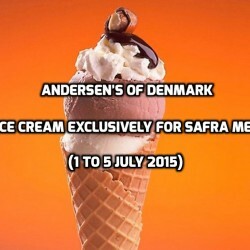 This is the perfect time to indulge in the creamy rich ice cream from Andersen’s of Denmark! Their ice cream is made from dairy products from Australia, chocolate from Belgium and flavours from Denmark. Their creamy Belgian Chocolate Chip ice cream is unbelievably rich with generous amount of chocolate chips, their Cookies and Cream is creamy vanilla ice cream mixed with an abundance of chocolate cookies and one of their bestsellers, Rum and Raisin, contains lots of raisins soaked in real Hansen Rum.